Speed and reliability give Benchmade Knives's 890 Torrent Folding Blade Knife the edge over other everyday carries, making it the ultimate multi-purpose blade. Speed and reliability give Benchmade Knives&apos;s 890 Torrent Folding Blade Knife the edge over other everyday carries, making it the ultimate multi-purpose blade. 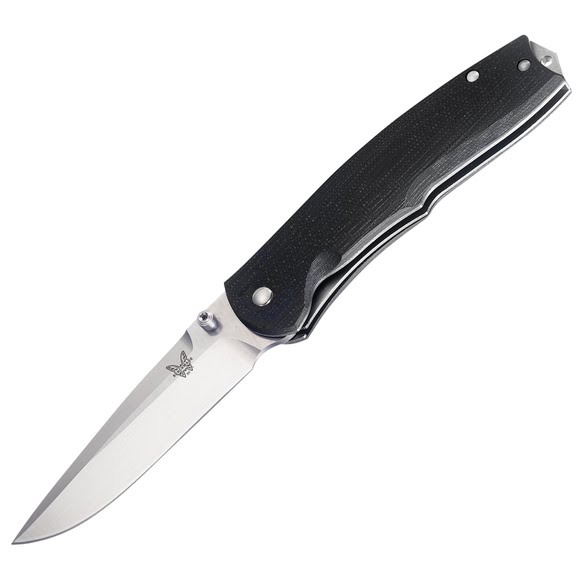 Another patented Benchmade exclusive, the Nitrous boosts the blade with ease. As the blade is closed the two torsion arms which run the length of the handle liners are secured in place and make contact with the blade tang. As tensioned against the blade tang, the user rotates the blade open to a 30-degree angle, the torsion arms take over and continue the blade opening process on its own. The huge advantages to the Nitrous design over other similar concepts, is that the blade must be rotated open to beyond a 30-degree angle, which offers added user control. An American made premium grade stainless steel originally developed for tough industrial applications. Known for its best all-around qualities, it offers great corrosion resistance with good toughness and edge quality.